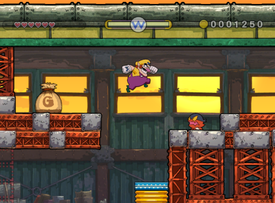 Wreck Train is the first level of the Rocking Range in Wario Land: Shake It! and is a (presumably) runaway train. This level has a few puzzles, mostly Bandineros as enemies, and also has many fire jets. Uncertain Blocks are quite common here and are usually placed in hard to reach places. Wario can use nearby enemies or objects to hit the corresponding Certainty Switch, turning Uncertain Blocks into Certain Blocks or vice-versa. This page was last edited on December 11, 2018, at 18:26.